This is quite the most brilliant way to use up a courgette glut I’ve discovered so far this year. Those of you who don’t have gardens, butter up your local allotmenteers (they’ll be delighted to offload some) or just buy half a dozen from your greengrocer. 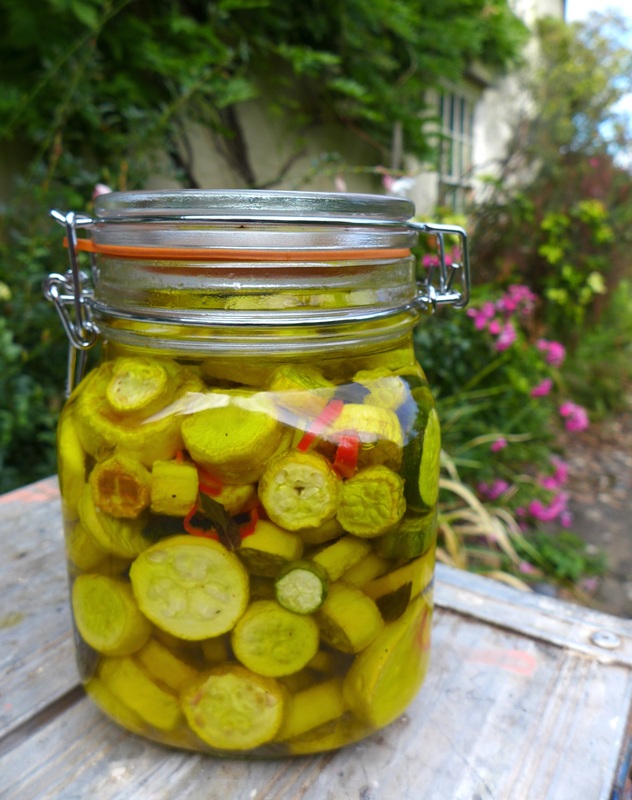 It’s really worth the effort to have a jar of these in the fridge. Eat them as an antipasto with a range of other little dishes, include them in a salad, pile them onto bruschetta with a dollop of burrata or curd cheese or, as Rachel Roddy says, just scoff them straight from the jar. The drying process really concentrates the delicately nutty flavour, rescuing even the the saddest supermarket courgette. This is slightly piquant but not quite a pickle. It does extend their life though if, like me, you are inundated with courgettes. It’ll keep for a week or two in the fridge. I’ve combined and adapted somewhat different recipes from two of my favourite writers on Italian food, Rachel and Frank Fariello. My thanks to them both. Top and tail the courgettes and slice fairly thickly. Traditionally they are then spread on a tea towel under a hot sun for a few hours, turning halfway, but as our heatwave seems to have ended here in the UK, either place them in a dehydrator or a very low oven. You’re not aiming to dry them completely, just until they have gone a bit leathery and wrinkly. Mine had four hours in the dehydrator at 40C. Heat a couple of tablespoons of olive oil in a large frying pan and fry them in batches until they are just speckled with gold on one side. Scoop them out as they cook into a large shallow dish, sprinkling each layer with a little salt and black pepper and a few torn mint leaves. Keep going until they’re all done. Put the vinegar, water and garlic clove in a small pan and bring to the boil. 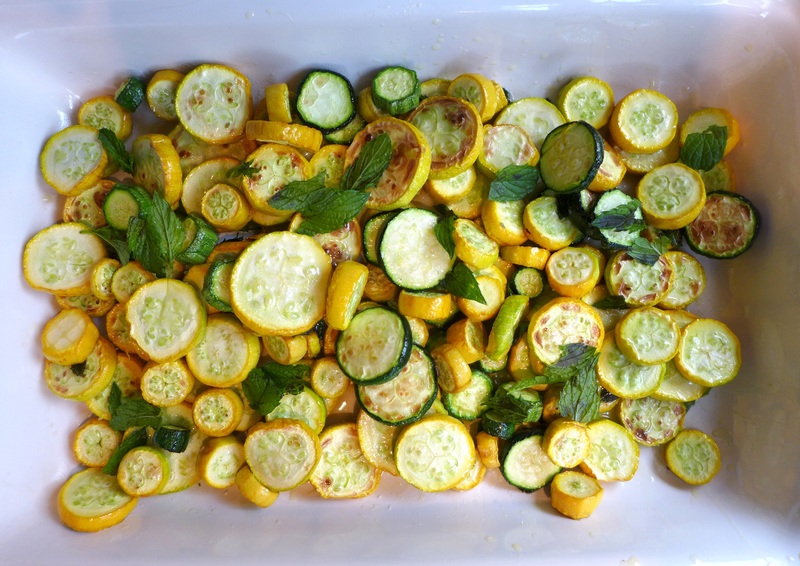 Pour over the courgettes and leave to marinate for at least an hour, turning occasionally if they’re not completely covered by the vinegar mixture. You can eat them at this point but they’re even better and will keep longer if you add a few extras. Slice the garlic clove finely along with the chilli, if using. Drain the courgettes, spoon into a sterilised jar, add the chilli and garlic (and more herbs if you like) then cover with oil. Keep refrigerated and use within two weeks. This entry was posted in Soups, starters and canapes, Vegetables and salads, Vegetarian and tagged courgette antipasto, courgettes in oil, Italian courgettes, piquant courgettes by Linda Duffin. Bookmark the permalink. I’m in the Rachel Roddy fanclub too, but I hadn’t noticed this so thanks. I’ve been dithering about a dehydrator for ages, but now I no longer have a veg. patch I guess the moment has passed. Do you use yours much? Er …. do I look like Frank 😉 ? I have an Instagram account, but rarely use it, just as I don’t use Twitter – too easy to get sucked in! Sorry, I’d just been talking to Frank on another thread and he’s mentioned here. I’m don’t have any affection for Twitter but I love Instagram, such a great community. You look overrun with courgette. Nice recipe too. Yes, I always plant too many because I think some will die, then of course they run wild. Mid non-existent winter here and am just unpacking my monthly on-line shopping: the zucchini look surprisingly nice . . . eeny-meeni- etc may just have a winter indulge of your recipe! Just somehow ‘Rachel eats’ had disappeared from my blogroll: thanks, shall resubscribe immediately . . . also a firm fan . . . .
She is great, and a really lovely, generous woman. Her Insta feed is full of ideas if you do that sort of thing. Thanks so much for the kinds words, Linda. And enjoy your antipasto! Looks fantastic. This looks fantastic, I can almost taste it~! I’m well on my way to overstuffing every corner of my kitchen with “they look so tasty. I’ll surely find something to do with them” impulse-buy zucchinis, like every summer, so this delicious recipe will be made in the very near future~! Thanks for sharing!